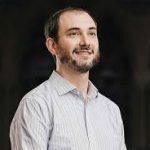 John serves as an associate minister at Old South Church in Boston, a progressive Christian congregation with long roots in social justice activism. His work includes preaching and teaching and pastoral care, but also includes particular focus on the congregation’s community organizing efforts. This centers around our congregation’s membership in the Greater Boston Interfaith Organization (GBIO). Composed of 22 churches, synagogues and mosques, GBIO is the Boston area affiliate of the Industrial Areas Foundation, a community organizing movement started by Saul Alinsky in the 20th century. John have been involved in campaigns for health care cost-containment, voter turnout for a local tax increase to support affordable housing, securing $60 million to launch a STEM high school to serve students of color, and an ongoing campaign to extract $10 million from a real estate developer to seed a home ownership trust for people of color historically locked out of home-buying. The training offered by the Industrial Areas Foundation (IAF) in community organizing has been hugely influential for John’s understanding of public life. The IAF uses an institutional strategy, meaning that it focuses on organizing people inside of existing faith institutions and unions, rather than trying to build a movement of otherwise unconnected individuals. The IAF focuses, further, on building political power locally through disciplined strategic victories aimed at improving its members communities in concrete ways. This has ranged from securing $1 million for new text books for Boston Public Schools to establishing regulations against predatory lending. To date, GBIO’s most well-known achievement was serving as the central grassroots organization responsible for passing the 2008 Massachusetts Healthcare Reform law. The so-called “Romneycare” bill was a political compromise struck between elected leaders, business leaders, and GBIO. This law served as the test case for what would later become the Affordable Care Act. John and his wife recently welcomed their first child, a girl named Veronica. John’s family are strongly committed to playing board games and doing things like going apple picking on the weekends. John was born and raised in Chicago, while his wife grew up in Brooklyn. This was the source of constant fights among us over whose hometown was better. By settling in Boston (a city we both agree is worse than either of our hometowns) domestic peace has been restored.